– For descriptions of the programs, click here. – FREE for schools in Edmonton thanks to Capital City Cleanup. Click here for information. We have an exciting new program for your classroom! 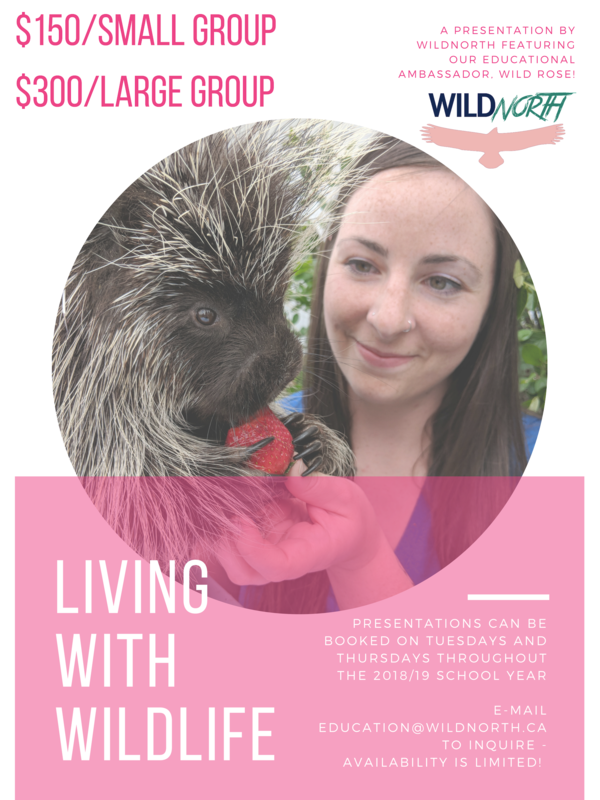 WILDNorth is offering an in-school presentation with a live wild animal ambassador; Wild Rose the Porcupine! This is a 45 minute presentation about living with the wild animals we share spaces with, and how to be an advocate for wildlife in the community (especially those animals that have a bit of a “bad” reputation! ), featuring an educational porcupine. Participants can have a once in a lifetime opportunity to safely see a porcupine right before their eyes! E-mail education@wildnorth.ca to inquire – availability is limited! ** Visits with Wild Rose and exact presentation style are subject to changes based on how she’s feeling that day! Can’t commit to a full presentation with Wild Rose? We’re now offering Visits with Wild Rose! Visits are 20 – 30 minutes long (depending on Wild Rose) and will focus on Wild Rose’s story, and information about porcupines. The pre-designed standard presentation is a general information presentation that discusses wildlife rehabilitation and how the participants can help wildlife in their community. Standard presentations have been designed for each age group! The custom presentations will be wildlife related, but can be designed to suit the needs of your group! Presentations are PowerPoint based — we do have a projector/screen/laptop we can bring if you do not have them available at your location. JWAP presentations in Edmonton do not get charged mileage. Living with Wildlife presentations have an additional charge for mileage when presentations are farther than 40.0 km away from the Wildlife Hospital (12515 128 Street). There is a limit to how far we will travel with Wild Rose.